Players must enter via the internet only. Entries submitted via the internet at www.masslottery.com must be submitted from a computer or mobile device located in Massachusetts. Follow the links on www.masslottery.com or go to www.patriotsmasslottery.com, establish an internet entry account and enter one (1) non-winning 5X CHAMPIONS ticket per the entry instructions. Only entries received at the 5X CHAMPIONS Second Chance Drawing website are eligible. Each qualified entry is guaranteed to be in one (1) of up to five (5) Second Chance Drawings. Odds of winning any prize in any Second Chance Drawing will vary depending on the number of entries received for that drawing. Entries received after the deadline for a drawing will be included in the next drawing. All entries must be received no later than sixty (60) days after the official end of game as announced by the Mass. Lottery. There is no limit on the number of entries that a player can submit. There is no limit on the number of Second Chance Drawing prizes one person may win. Federal and state taxes or other personal expenses are the responsibility of the Second Chance Drawing winner. Second Chance Drawing winners’ names and city or town of residence may be posted on the Mass. Lottery’s website following validation of winners after each drawing. Touchdown Challenge Finalist, VIP Season Ticket Package, Away Game Trip Package, Super Suite Ticket Package and Game Day Ticket Package winners will be notified by the Lottery and must complete a claim form. Prizes are subject to applicable taxes and withholdings. Merchandise Prize Pack winners will be notified by the Patriots for selection. Merchandise prizes will be mailed to the winner’s residence within sixty (60) business days of notification. The Lottery reserves the right to substitute different merchandise of equal or better quality. 5X CHAMPIONS Second Chance prizes are not redeemable for cash. Patriots tickets are subject to restrictions. All game tickets, seats, authentic Patriots jerseys, mini helmets and autographed footballs will be randomly assigned by the Patriots and all assignments are final and non-transferable. Second Chance Drawing entrants must be at least 18 years of age. Second Chance Drawings are subject to the rules and regulations of the Mass. Lottery and its administrative bulletin. Second Chance Drawing entries are void where prohibited by law. 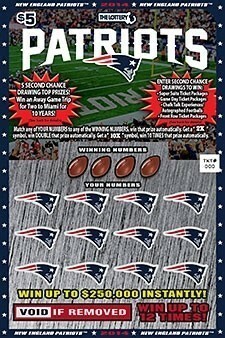 Visit patriotsmasslottery.com or call 1-800-511-6309 for info. If you have a problem with gambling, help is available. You must be 18 years or older to play the Lottery.